Choose the best medium for taking notes--by hand or by laptop. It will depend on your own preference and the content of the course. Choose the option that's most comfortable to you. When in doubt, go by hand. There's something about handwriting notes that helps you process them in your brain better. Begin actively reading by previewing a work to get a general idea of what to look for later when you read it more carefully. Examine the title and the abstract, if it's available. Look at the section titles, paragraphing, and other stylistic and structural features. Skim the footnotes. Pay attention to key concepts, considering the relationships between ideas, noting transitions, and thinking about how the material fits into the course as a whole. Mark the text. Underline important points, including the thesis and topic sentences. Circle words, phrases, or ideas that you would like to think more about. Draw lines between related words and ideas. Number incidents that occur in sequence. Note unfamiliar concepts and words. Look up words. Write their definitions in the margins, or create a working vocabulary list. Put question marks beside confusing passages and unfamiliar references. Talk back to the text. What questions do you want answered? What disagreements do you have with the author's arguments? Note cross-references to other materials you have read on the subject. How have their points agreed or disagreed with what you are reading now? Write summaries of the text to ensure that you have understood the material. Paraphrase as best you can. Copy statements that you might want to quote directly in your work. Use quotations marks to ensure that you know this is a quote (so you do not inadvertently plagiarize the passage). Note the complete bibliographic information for the quote. Create a working bibliography of all the sources you read for a project. Note URLs of the websites you visit, as well as the dates that you accessed them because websites can sometimes disappear. Keep a journal, either in a notebook or on your computer, to record the ideas and questions that occur to you as you read. In your journal, expand your marginal annotations, record your responses to works you have read, note questions, and explore emerging ideas. Keep things neat so when you refer to your notes later, you will not be confused. 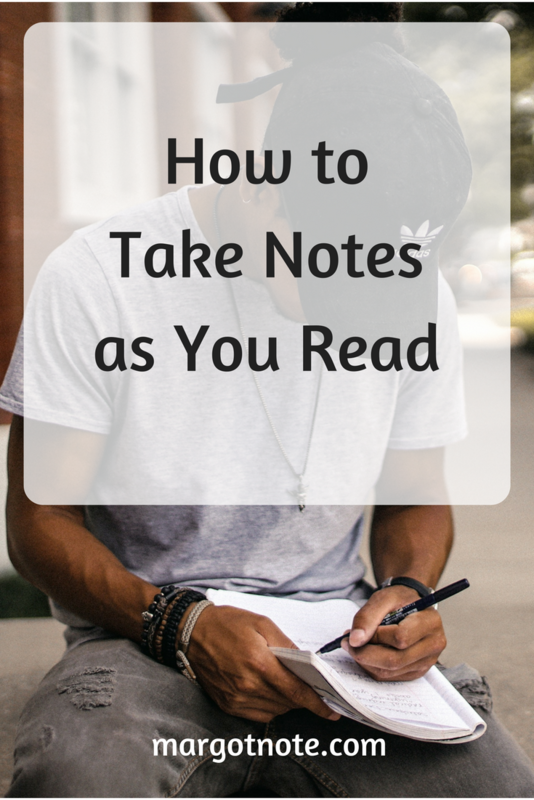 What tips do you use when reading and taking notes? I'd love to hear them. Share your suggestions in the comment section.